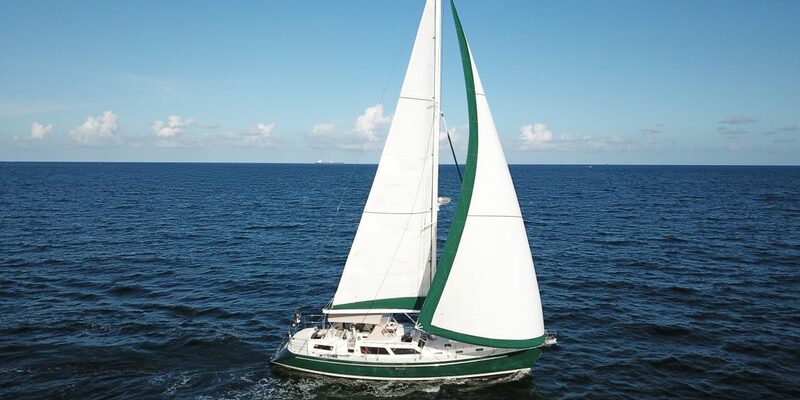 The photo above is of Summer Dream which is for sale in Fort Lauderdale in 2018/2019. Click here for the sales ad. 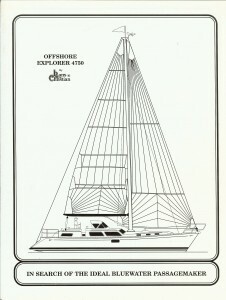 Subsequent to Tony Seibert’s consultation on the Hylas 49, Tony launched in association with Hans Christian Yachts the Explorer series which includes this 4750. The model was introduced at the Oakland Show in 2000 and then trucked to the east coast for the 2001 show season. He contracted legendary designer Chuck Paine and famed sailor Nigel Calder to engineer them to meet specific design objectives for serious offshore sailing. The result was a breed of offshore vessels that took the marker to a new height in quality and construction. The more one looks the more one sees the countless hours of design from a true sailors viewpoint that went into these vessels. 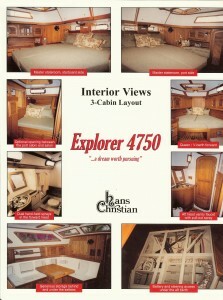 From the first glance, it is obvious that the Explorer 4750 draws on Tony’s experience with the Hylas 47 and 49 models. He previously owned a 47 and 49 and was instrumental in the transitioning between the two designs. The design also is the ninth in a lineage of Paine designs he calls his “Bermuda Series.” The 4750 has a raked bow, modest sheer, and true sugar scoop stern aft. On deck her cabin truck is a raised saloon instead of the lower profile Hylas 49 making for a naturally light and airy interior. While the saloon styling of some yachts aesthetically detracts from otherwise pleasing lines on the 4750, Chuck Paine has seamlessly integrated the superstructure. Underneath she has a long fin keel with a partial skeg hung rudder arrangement. One of Paine’s primary objectives for the Explorer series was to create a robust, safe, high performance offshore sailboat that can be easily handled and maintained by a couple. The hull is solid FRP from 6″ above the waterline down while end grain balsa above and in the deck for high shear strength. At high stress areas, the hull and deck are solid glass reinforced with Kevlar. The fiberglass layup consists of unidirectional roving and vinylester resin for superior resistance to osmosis. The 5′ 11″ bulb keel consists of externally mounted lead ballast mounted onto a fiberglass stub. The rudder has a partial skeg supported by three large bearings. The double spreader 66′ rig (or optional 63′ ICW rig) is anodized aluminum and keel stepped. The spreaders sweep aft to eliminate the need for a babystay through they are rigged with an inner forestay for a cutter sail plan. There were two distinct equipment packages: one for coastal cruisers and another for so-called world cruisers. The world cruiser package has standard a beefier alternator, an 88lb Delta, radar, extra electronics, etc. Explorer Yachts trade marked a safety feature by the name “Double-Bow Crush Zone.” Some 4750’s have a literally complete duplicate of the bow-cutwater-forehull section set inside the outer hull which is separated by foam. This crush zone can handle a shock of 38,000 lbs. of loaded vessel hitting a submerged container. There are two forward lockers next the the windlass for storage. The 4750 has wide decks with the shrouds mounted well inboard and plentiful deck hardware. The toerail is oversized and slotted aluminum though teak trim was an option. Inboard deck drains minimize streaking on the hull. Aft are two lazarettes and a storage area in the swim platform. The cockpit is 7′ long with well thought out lumber support, foot purchase, and winch location. The helm is actually further set back at 3/4 LOA than on most center cockpits in order to maximize visibility and dryness. Controls for the engine are to starboard along with additional switches. Here all the skill and experience of the Hans Christian yard are put to good use. There are two and three stateroom versions. Her master stateroom has a 6′ 10″ length centerline queen berth with vanity seating. The ceilings are beautiful solid teak vertical staving. The two stateroom versions have a huge sail locker forward. Aft is a portside Pullman, settee, and ensuite head. The three stateroom versions have a queen berth forward with a third cabin aft portside across from a shared head. Th amidships saloon was customizable and could have any arrangement of swivel chairs, dinette, or L-shaped settee. The popular double walkthrough aft opens up the layout though necessarily slips the galley portside. The master head with separate shower is to starboard. Overhead are long teak handrails and fore and aft white grooved wood. The beautiful forward facing chart table is comfortable with access to electrical panels and close to the companionway starboard. Standard was a 75HP Yanmar diesel with access under the companionway similar to the Hylas 49. An optional 100HP Yanmar was even better – no has every complained about an overpowered auxiliary. Tankage is 180 or 240 gallons for 1,300 nautical mile motoring range at 8 knots constant. She is a serious long-range cruiser that is incredibly fast. Sea Trials for hull number three were in San Francisco Bay. The Explorer 4750 sailed 8 knots close reaching, 9 knots beam reaching, and 10 knots broad reaching in winds from 22 to 30 knots. The first reef was at 22 knots and a second reef at 28 knots. The tagline says it all, “In search of the ideal bluewater passagemaker” and darn if Tony Seibert, Chuck Paine, and Nigel Calder didn’t get close. If one is looking at three stateroom offshore yachts such as the Hylas 49 and Tayana 48, the Offshore Explorer 4750 is a rare variant that should draw serious consideration. She originally retailed at $609,000 for a world cruiser equipment package and is a unique value on the brokerage market. 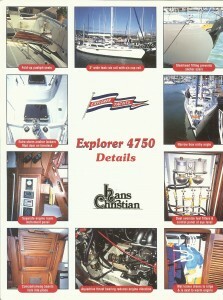 There was also a sistership Explorer 4850.